You're the traveller who wants to make each minute of your trip count. From the point of booking to check out on departure, you're focused on efficiency and functionality. You appreciate the design and style that makes everything a little more pleasant and easy; exactly what Next Hotel Brisbane is all about. Throw out your old expectations of what a hotel should provide and welcome the Next experience. Whatever we thought could help create a hassle-free and comfortable zone, we’ve provided. Complimentary high speed WiFi throughout the hotel, four free mini-bar items of your choice daily, access to the Next Lounge, outdoor swimming pool and 24-hour gym, as well as the ability to check-in using our mobile app. Standard Queen rooms are located on floors 5 – 16 with city views. Superior Queen rooms are located on floors 17 – 26, overlooking the city and offering distant river views. Deluxe King rooms are located on floors 17 – 26, overlooking the city and offering distant river views. Time is a premium, so we've put the best food & beverage options right at your doorstep. 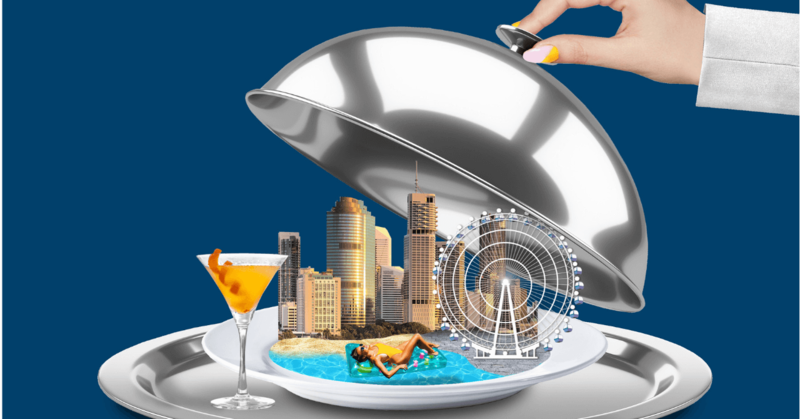 Whether it's a comfortable yet stylish sit down dinner you're seeking or just a box to go, you'll find an array of dining options to suit all tastes at Next Hotel Brisbane. A healthy appetite and $20 is all you'll need for a classic lunch at Lennons Restaurant & Bar. Choose from our special a la carte lunch menu and receive a glass of house wine, beer or soft drink. Why not add a little extra with a decadent dessert for just $8 extra? Available every day from 11:30am to 3:00pm. Use the hashtag #nextbrisbane to allow us to share your photos. The Wheel of Brisbane is recognised as one of the most exciting additions to the Brisbane city skyline. You will be inspired by the breathtaking views across the iconic Brisbane River.